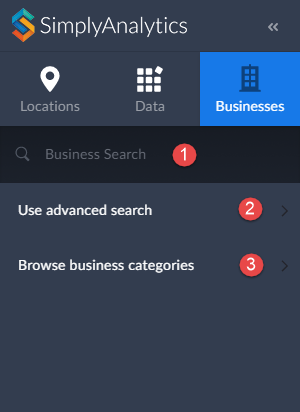 The quickest and easiest method for adding businesses. How to Use It – Simply type in a keyword such as “coffee” or a business name such as “Starbucks” in the available box shown above and hit enter on your keyboard. The most advanced method. This search allows you to build a business query using up to 4 total conditions. While this method is a bit more advanced, the tradeoff is you’re able to build a query to your specs. 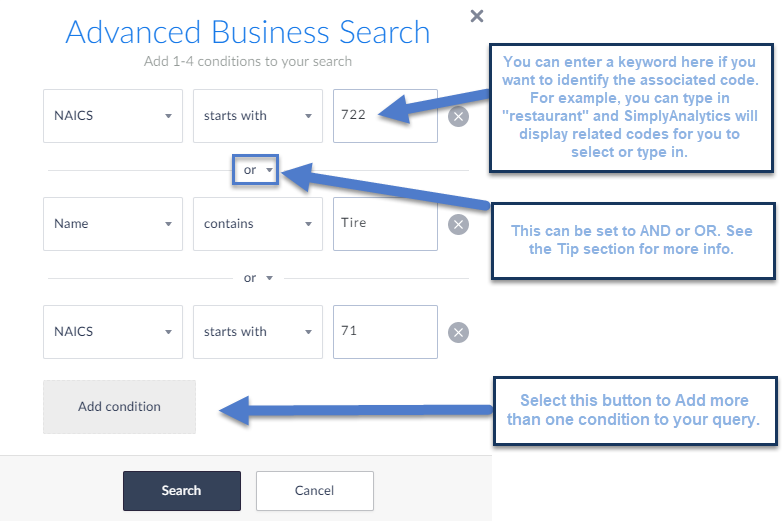 How to Use It – select Use Advanced Search shown above, and from there you can build out your query. Below I am searching for NAICS starts with 722 (Food Services and Drinking Places) OR Name Contains: Tire OR NAICS starts with 71 (Arts & Entertainment). If you want to browse for specific industry codes, this is your go to. This method allows you to jump into subcategories within a major industry so you’re able to browse for the code you had in mind. How to Use It – Select Browse Business categories and specify at the top if you are browsing for NAICS or SIC Codes (NAICS is the default). From there, you can jump into categories and subcategories by making an initial selection. The example below went from: Retail Trade (44) to Clothing Stores (4481) and lastly within clothing stores you can specify which clothing store type you are looking for. That’s it for our inaugural SimplyAnalytics blog post – we hope this post helped clarify the Business search. Stay tuned for more!